How to select jaw crusher and cone crusher in open-pit mining? NewsHome > News > How to select jaw crusher and cone crusher in open-pit mining? Jaw crusher and cone crusher are widely used in the open-pit mining such as quarry plant, artificial sand making line, iron ore crushing plant and so on. How to select jaw crusher and cone crusher in open-pit mining? Buy suitable stone crushers must be according to the physical and chemical characteristics of ore and the position and characteristics of work place and other factors. Generally speaking,cone crusher and jaw crusher are all suitable for crushing high hardness materials,for example iron ore, pebble, cobble granite, bauxite,basalt and quartz. As a result of jaw crusher has wide opening mouth and high crushing ratio, jaw crusher is mainly used as primary stone crusher to process big size rocks and stones. Cone crusher is always used for medium and fine crushing stage in stone crushing plant. Jaw crusher and cone crusher can form the optimized solution installed with vibrating feeder, belt conveyor and vibrating screen. Cone crusher is highly praised for its excellent performance, wear resistance parts and high production cost. 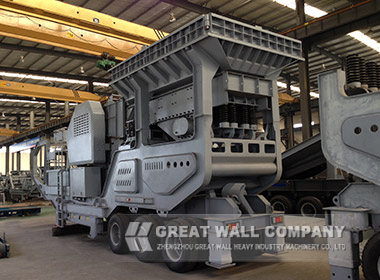 Jaw crusher and cone crusher play more and more important role in open-pit mining. Previous: What are technical features of Great Wall stone crushing plant ? Next: How to buy impact crusher at suitable price in mining industry ?